Yesterday we looked at Britain’s most southerly railway station (also the most Westerly in England) at Penzance. Quite close by is Britain’s most southerly point – Lizard Point. Readers may be relieved to know that no railway ever went to Lizard although the railway company ran one of the earliest motor bus services from the nearest station at Helston. There are other things to get excited about at Lizard; things that belong in the natural world. When I visited back in 2003 I was ignorant of what might be expected there. My daughter’s boyfriend (now husband) was captivated by seals. And so might I have been had a bird not flown by. To my utter amazement, it was a chough. Future son-in-law was unimpressed. ‘It’s just a black bird,’ was his summing up. 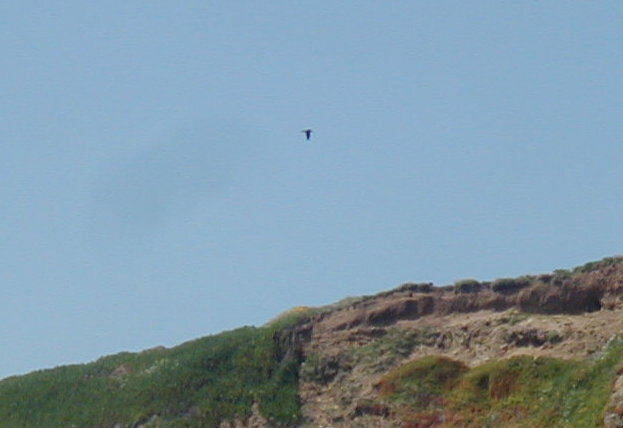 But I didn’t even know I could see a chough in England and yet there was the distinctive red beak and legs. I was quite enthralled by it. Sad to say I got no decent pictures for at that time I was using a lovely digital camera with a maximum resolution of 1.3 mega pixels. Distant birds and seals had to stay distant. You can’t digitally zoom in very much at all. So that’s my chough and I can see why son in law wasn’t much impressed. Whilst there, I photographed a flower which I didn’t recognise. I see I captioned it ‘Lizard Flower’. Let’s fast forward to 2011 and we were at Lizard with son and his girlfriend (now wife). 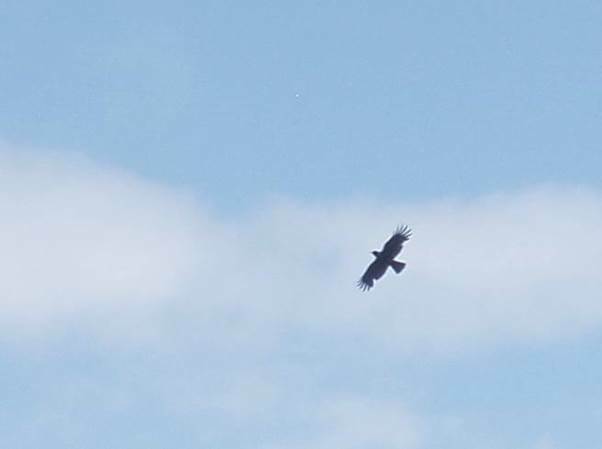 There were no seals to be seen, but the RSPB have now erected chough watching places and have experts on hand to tell you where to look and what to expect. I was now using a 6 mega pixel camera so I have a bit of digital zoom capability. 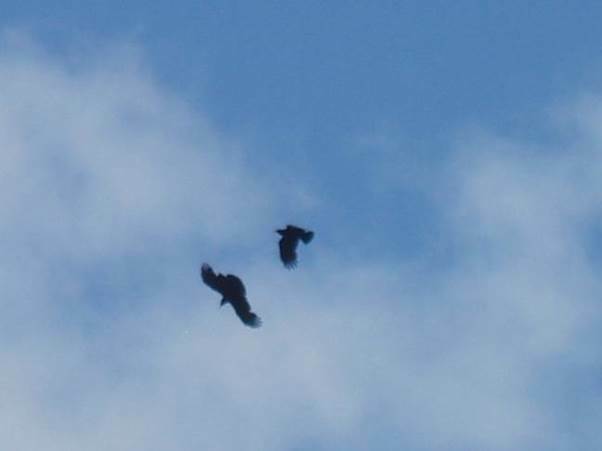 Choughs remained a bit distant, but definitely chough like. Two of them did a little bit of aerobatics for us. 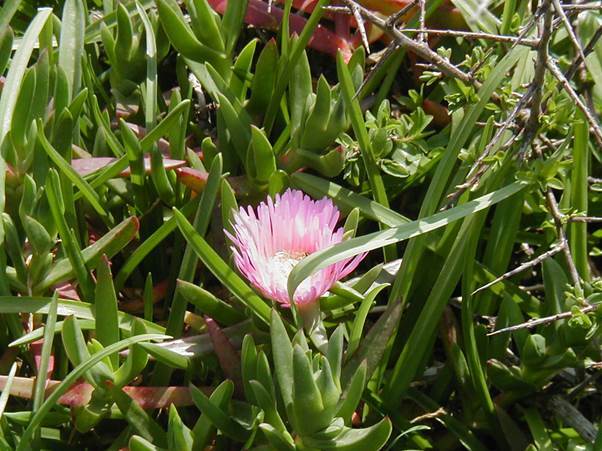 The ‘Lizard Flower’ I now knew was an invasive species from South Africa – the Hottentot fig. It was everywhere. 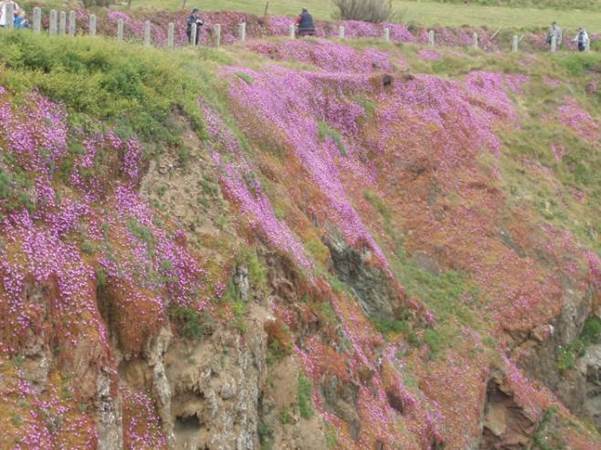 They look pretty, but are deemed ‘pernicious’. 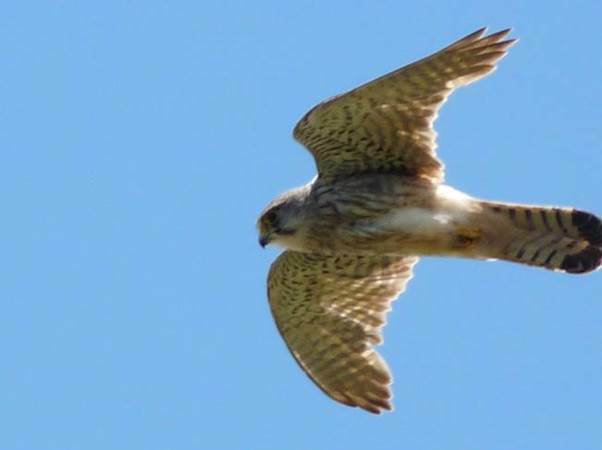 Sadly, my son with a much better camera than mine never got a chough, but he did pretty well with a hovering kestrel. Lizard is beautiful. I love going there. You won’t be the only person there, but it is not too trippery or commercialised. For me there is something romantic about places at the far distant end of a journey. Penzance was such a destination and one I only dreamed of in my childhood. I was aware from an early age that if you caught a train heading west from London the furthest point you could reach was Penzance in Cornwall. The place was special in my mind. I may never have been there and I may never have imagined that I ever would go there, but to be the distant terminus of a train journey imbued the place with a specialness that I still feel, even though I have been there many times now. It is about 305 miles from London to Penzance but back in those pre-car days of the 1950s, Penzance might as well have been in another galaxy for all the chance I had of getting there. I first got there in the early 1970s but my pictures today date from 1989 when I visited with my children. Yes, they had to put up with a railway nerd father! There’s the station and it doesn’t look all that special or romantic really. The loco we see is a diesel shunter. 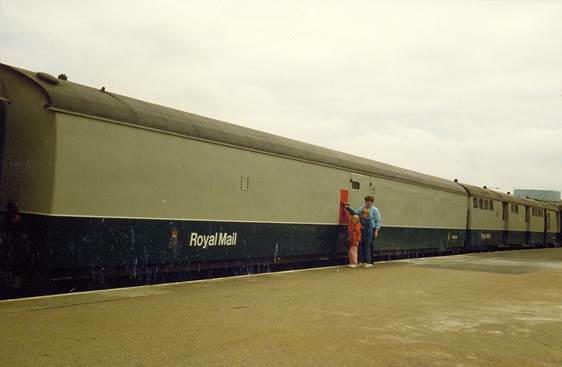 But there was interest for back then there were still travelling letter sorting offices and one left Penzance each day. I am so pleased we got our children to post cards directly onto the ‘TPO’ or travelling post office. And here they are, with my wife, doing the posting. Times change. 24 years ago we did these quaint things like sending post cards and letters. Who does it now? Not many people for sure. The text, the email or the tweet have rather taken away from the snail mail. It’s sad in a way. On this blog I have shown a number of postcards sent by my Edwardian relatives. The electronic messages of today can be so fast and furious that they are also bound to be so transient. Family historians of the future won’t have the wonderful resources I have. And train enthusiasts have lost out too. The TPO trains no longer run. In fact mail is barelycarried by rail at all in this country. What a shame. The station probably doesn’t show Penzance at its best. It is a busy little town with shops and plenty to see. The Post Office trains don’t run, but Penzance is served well by trains still. It takes about five and a half hours from London. Trains also run to destinations in Scotland. How do you spell kartie? That’s the spelling I have chosen for a word never written down. People still have ‘soap box karts’ however. The idea was simple. 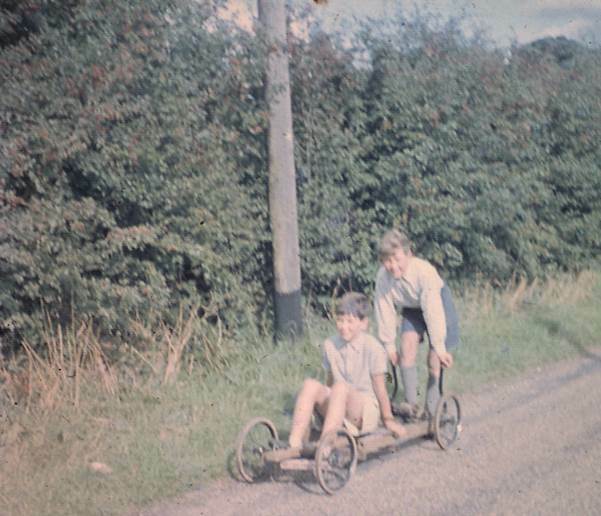 You got some wheels from a pram or pushchair and attached them to a basic wood frame. The front axle pivoted in the centre so you could sit on the frame and steer with your feet. A soap box kartie had a wooden box as a little bit of bodywork. My brother and I had the wheels and wanted a kart. My dad, on the other hand, wanted a porter’s barrow. We all got our wish. The pivoting front axle was held in place by a nut and bolt and could easily be removed. My dad added a couple of push bars on the back. These could be the load carrier for his porter’s barrow. Our kartie was both a fantastic toy but also a utilitarian device. It was typical of my dad that he could come up with such a compromise. Storage space was always at a premium ad this way, we only needed one device. And here are brother and I. I’m riding and he’s the power house. I suspect I had more fun than my brother. He was older than me, that bit heavier, and always much stronger. I was raced along by him, whereas progress was more pedestrian when I pushed him. We used to set out obstacle courses and push each other round them. I was propelled at breakneck speed and incurred penalty points. I pushed hard hoping to make him get penalties but he could always find time to avoid them. Little brother was doomed to lose. The picture was taken in 1958 and marks my dad’s first foray into colour photography. In those far away days we could happily play on some local roads. Cars were still a rarity. I’ll never look back and say, ‘things were better then’. But I do believe they were more carefree days for children. The little lane we were on is now quite busy with traffic so devices like this no longer get pushed around. Instead there are sanitised versions at centres – possibly go-karts with an engine – to seem more exciting but without that freedom to roam. Looe is a small fishing harbour and town on the south coast of East Cornwall. 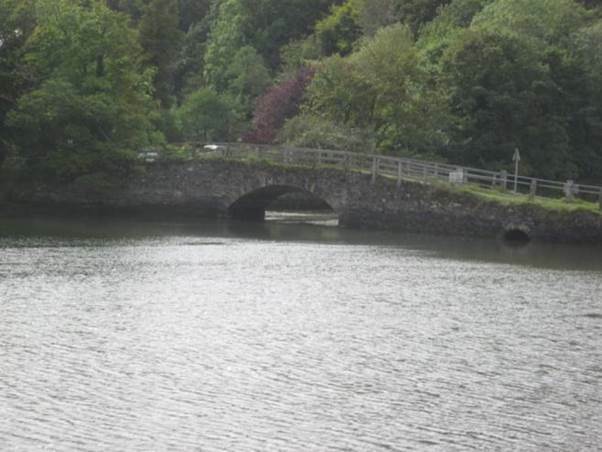 It’s a pretty place with the Looe River running through it. Like many a Cornish seaside place, parking can be a problem, but Looe has an advantage. It has a branch railway still running. And a fascinating line it is too. 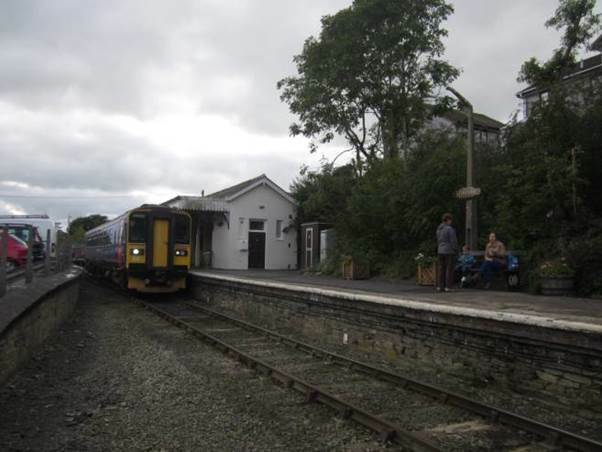 It starts at Liskeard which is also on the main railway from London to Penzance. 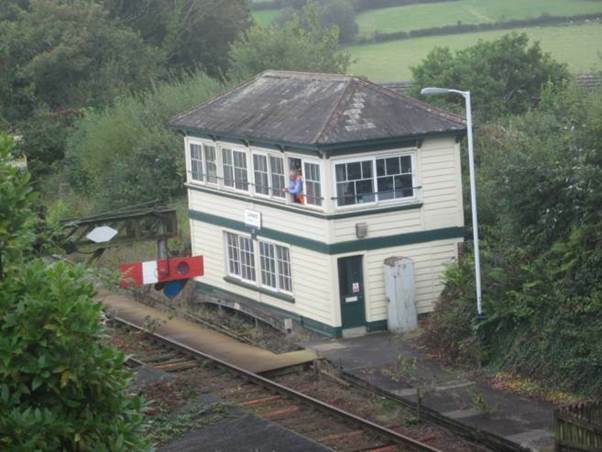 There’s a lovely GWR signal box and the signal man when we were there was very chatty. There is even a super lower quadrant signal. 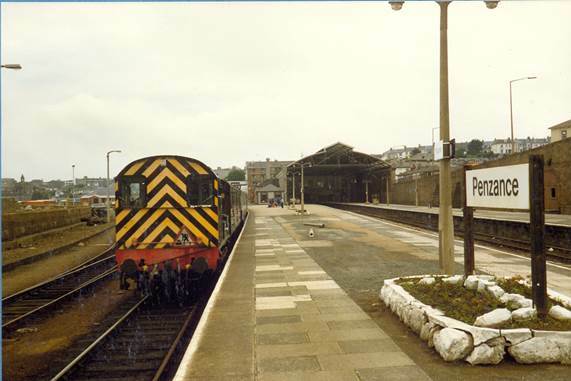 Now oddly, for Looe is south of Liskeard, the line starts at a terminus platform and the way out is northeast. 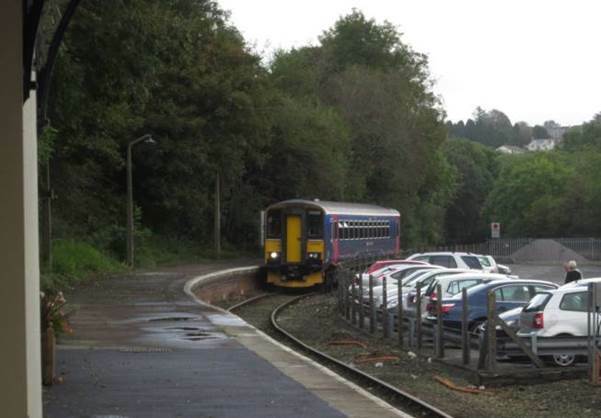 There’s the single carriage train arriving from Looe. We boarded the train for it was going back to Looe. 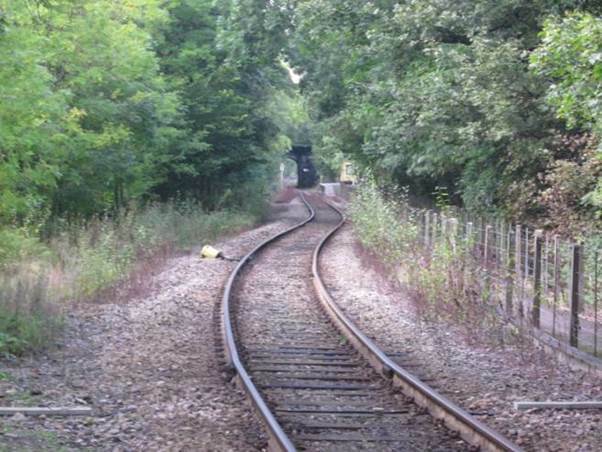 This is a remarkable bit of railway. Within a couple of miles we have gone hugely downhill, passing under the main line which strides across us on a lofty viaduct. To do this we have changed direction on a tight curve. We left Liskeard heading northeast but we are travelling southwest when we go under the viaduct. We continue to work down and around. By the time we stop at the little station at Coombe we are heading almost due north. 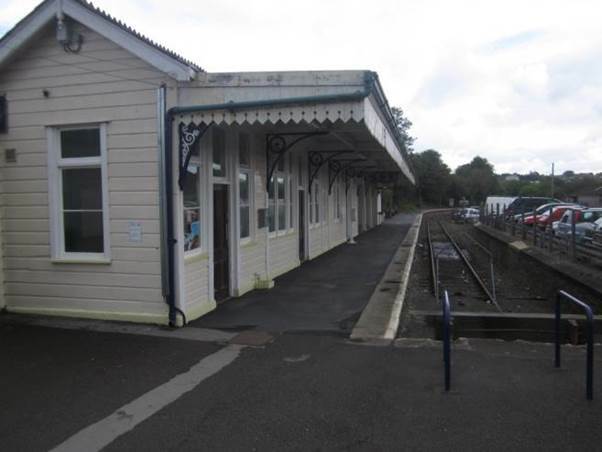 We have travelled over two miles but are only about half a mile from Liskeard station. Near Coombe we have joined a much older railway – one originally built to carry mineral traffic from the Cornish hills to the harbour at Looe. That happened at Coombe Junction. 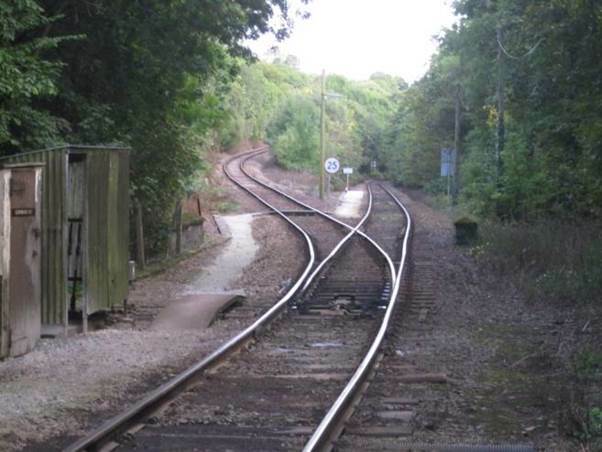 But we, at Coombe station, are heading away from Looe which is down the right hand railway, whilst the line to Liskeard veers off to the left. Our driver must go to the cab at the other end of the train for the rest of the journey. And there, in the distance, is unlikely Coombe Station. It is nowhere in particular, really. We now really begin our journey to Looe, travelling down the East Looe River – a pretty journey. 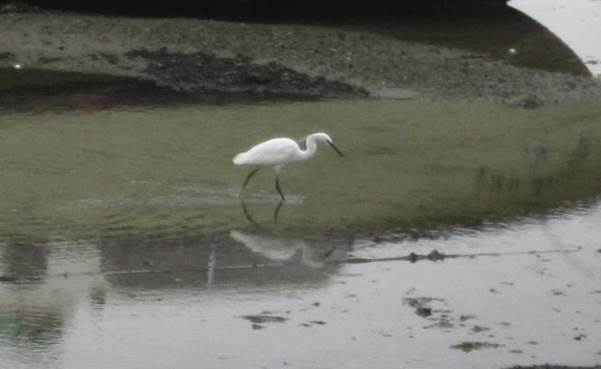 Looe is a great place for egrets – the incomer birds that seem to have now colonised our country. For our return, later in the day we took a riverside seat in the train. Trains, these days, are air conditioned. You can’t open windows so photography is harder. But here’s a typical view of the river. And so, back to Liskeard, with the same performance at Coombe, but in reverse, of course. It must be lucky that this odd little line survived. It is good to see that there are some steam specials on the line as well as the simple little diesel railcar. It’s a lovely trip whatever the train – a journey of less than 9 miles in total. We made the journey on September 27th 2012. Some folks say that Shropshire was the birthplace of the Industrial Revolution. It was in Coalbrookdale that Abraham Darby first smelted iron using coke as fuel. He built the first ever iron bridge which crossed the River Severn at a place we now call Ironbridge. Just upstream, a second bridge was built at Coalport. The year was 1818. 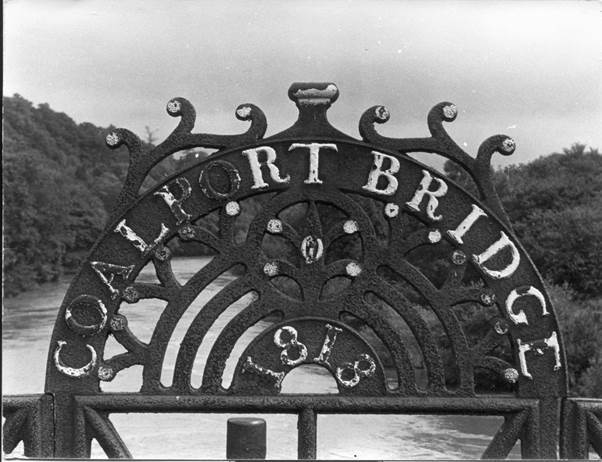 The bridge is made of cast iron and is topped off with the neat sign I photographed back in 1972. This was at least the third bridge built here. A wooden bridge with a central pier was washed away in 1795 and a hybrid wood and iron bridge replaced it, opening in 1799. But the bridge proved inadequate and it was completely replaced by the present iron bridge. It was ‘renewed’ and strengthened in 2004/5 and still carries road traffic. It is rather an unsung neighbour of THE Ironbridge but it is a very elegant structure in its own right. If you happen to be in the area, then it is near the tar tunnel and a pottery works. They are all well worth a visit. My mum died when I was a teenager. I never knew her with me as a real adult, although I daresay I thought that, at aged 17, I was properly grown up. But she had been ill for some years – in and out of hospital, recovering from surgery or radio-therapy. In a sense she had ceased to be the real person some years before death, as coping with illness became the major struggle. 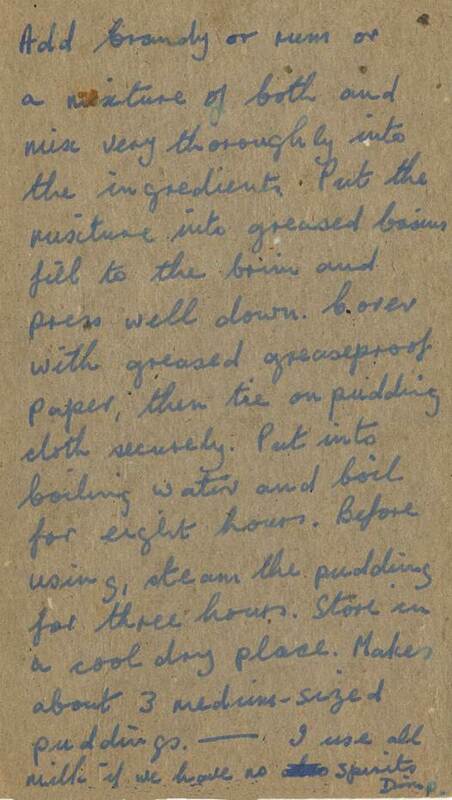 So I was pleased, recently, to be given a recipe written out in mum’s hand. 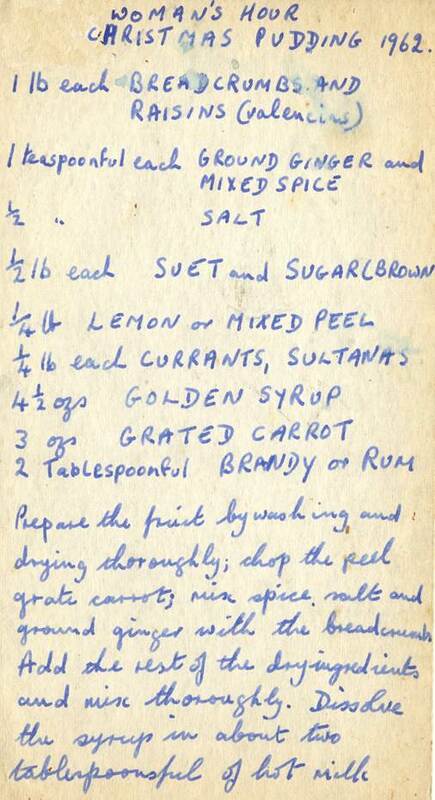 It’s for Christmas Pudding, so thoroughly out of season just now, but then it is never too early to make your puddings. Do you know, I think my mum might have written that on one of those cards that used to separate Shredded Wheat in their packet. As a girl, my mum had dimples which earned her the nickname of Dimp which stuck with her throughout her all too short life. One thing I am utterly convinced my mother would have changed was the cooking time. There’d have been no eight hours of boiling for us, for my mum (and dad) believed in pressure cookers and that probably cut the cooking time to about half that given in the recipe. 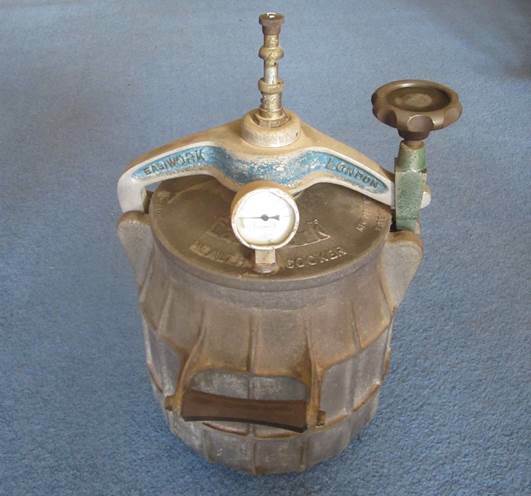 And there is the pressure cooker – or a second one my dad acquired. It was a hissing and fearsome monster that was in regular use for all sorts. It even went camping with us, for it enabled a whole meal to be concocted and cooked on one primus stove. My wife still makes our Christmas Puddings and she, too, uses a pressure cooker, but not the rather bomb like structure that mum used to use. One of life’s pleasures is going to the Isle of Wight. From where we live it is not that far to drive to Lymington. Usually, we leave the car there and have a day on the Isle of Wight without our own vehicle. We have legs and can walk and we are also of the bus pass generation so we can travel on the island’s bus network (and very good it is) for free. 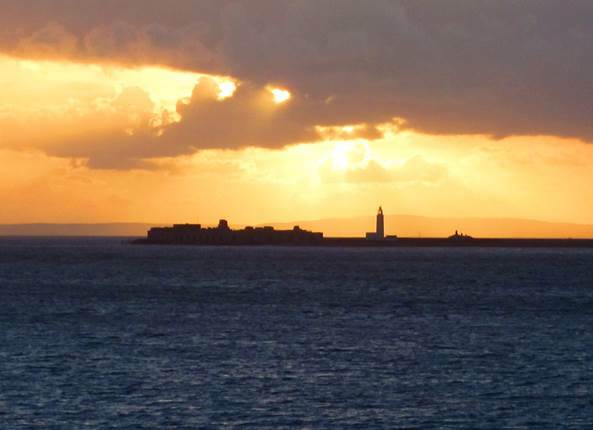 We visited on 10th October 2012 and our return home, across the Solent from Yarmouth, was as the sun went down. Now a happy nerd can admire beauty. 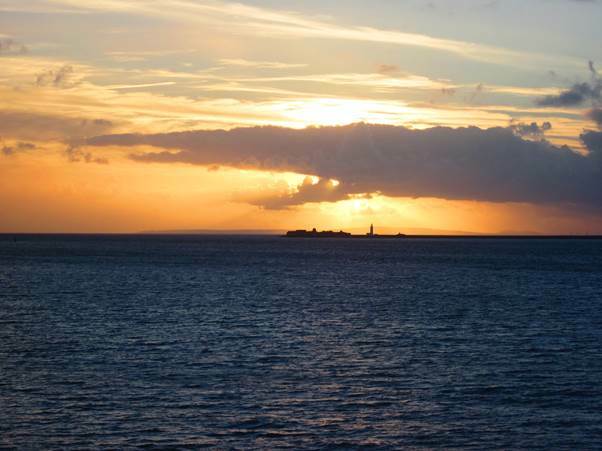 Sunsets can do it for this one and here we see the see and the sky and Hurst Castle which is on a long spit of land that stretches out across the Solent from the mainland of England. Fantastic. I do not regard myself as a special photographer but sometimes you are in the right place at the right time. And I say, ‘why not?’ After all I do bill myself as a nerd. But actually, this is different and this will bring back memories for all sorts of people. For this was something that you found in use in shops. As a child, I loved it if my mum took me to the Co-op household department. 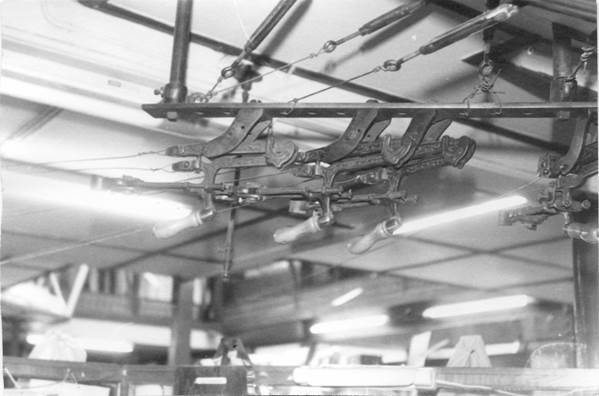 They had a cash railway – one of those overhead money carrying systems that had a central cashier, often in a sort of cage and a system of cables which could carry small containers to the various different counters. The counter staff sold something, put the money and the bill in the container, pulled the lever and the little container whizzed overhead to the cashier. They stamped the bill and made sure the right change was in the container, pulled their lever and off it went back to the counter. Times change and the old Co-op closed and the cash railway went. But when I moved to Devizes, the department store, Sloper’s, had a cash railway. Oh what a treat, now as a sensible (ha, ha) adult, to watch those capsules race through the air to the cashier. But times changed again. Sloper’s was not profitable enough and closed. The cash railway was a thing of the past once more. But I did take some photos and here is the network of wires at the cashier desk. There are four lines, all aiming in different directions. I’m told that once upon a time, Sloper’s also used a pneumatic tube to get bills and cash to a separate nearby property. Sloper’s was a treasure trove of antique items. And this was 1976. 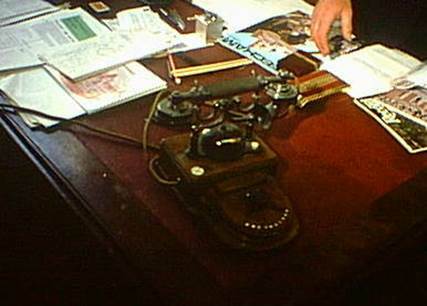 Look at that telephone on the desk. Magic. No shift key here – just a completely separate set of keys for capital letters. 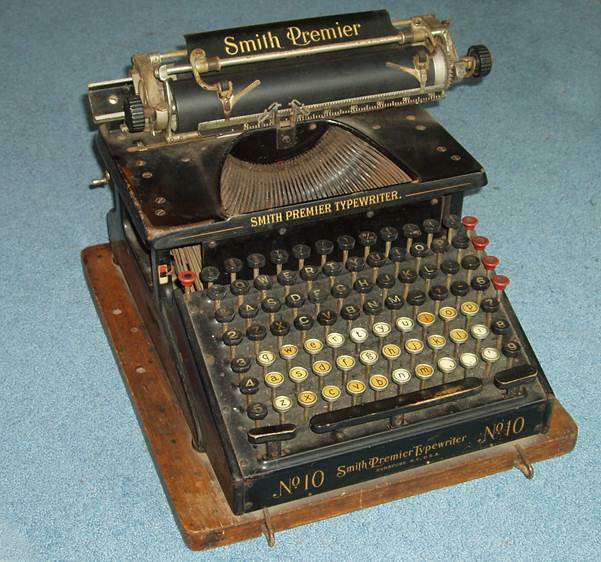 I no longer have the typewriter. I gave it to the Wiltshire Museum in Devizes because, obviously, it has real Wiltshire and Devizes history. And in the museum it joins Sloper’s cash railway. The museum has set up a part of it and so once again it can be seen in action. I have always been a cat lover. There have not been many periods in my life when I haven’t shared a home with a cat or two. The earliest I remember, from childhood, was a ginger lad who adopted our house. We never really named him. He was just ‘Puss’. After his departure we got a black and white cat which, officially, was called Blackett. Then I did what young men do. I left home and got married and for a while we had no cat. But an offer was made by a colleague. We could have a kitten born in one of her husband’s barns. We wanted two felines, and it was suggested we’d be welcome to a one year old cat as well. It’s that one year old we look at today. He hadn’t really been named by the previous owner. She referred to him as ‘Willy Mog’. We fancied a name with a bit more class so Willy Mog became Wilmot. Here he is in 1972. Wilmot was a very even tempered, placid cat – quite unlike the kitten we got at the same time who was a right scaredy cat. And Wilmot was a character and, at times, an embarrassment. We recall the time when a neighbour had walked back from town with the baby in the pram and the shopping on the tray under the pram. As baby was taken in, Wilmot saw his chance and grabbed lunch off that tray. Another time he returned with paint on his paws. This, we realised, was from a house opposite where upstairs window sills were being painted. Wilmot could be a pain if we went for a walk. He liked to come too but would reach the end of his known territory and then cry pitifully. Sometimes he’d continue to follow, but truly unhappily. On one occasion we passed a badger sett and almost lost Wilmot down the holes. He may have been lost and miserable, but a new experience was to hand. We got him out, abandoned the walk and took him home. When Wilmot was about six, we moved from our all electric estate house to our pie in the sky wreck in the country. Wilmot came too and to keep him safe, we shut him in the lounge. There wasn’t much in this room, but when we looked in, Wilmot had done the impossible and vanished. We were entirely baffled but then a face appeared from within the chimney. Yes, there was (and is) an open fireplace but we had paid no heed to that since we had never had a fireplace before. 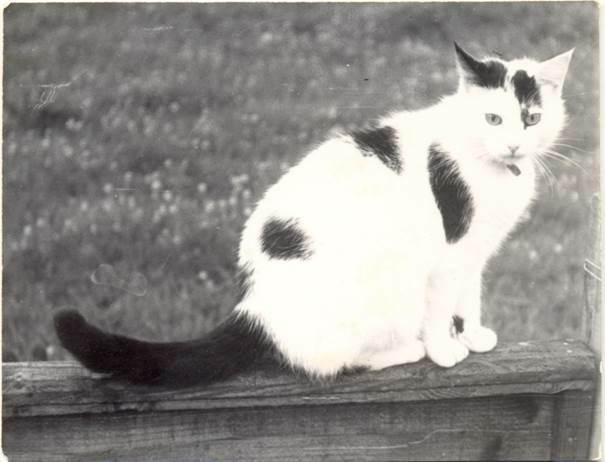 Wilmot was fine, but as the photo shows, he had been mostly a white cat. Now he was soot coloured. We had a canal boat holiday booked soon after and, not being able to guarantee neighbours to care for cats, we had booked him and his friend Inca into a cattery. Wilmot must have spent a week licking himself. He came home clean. Wilmot had a good life and lived for about 12 years. A string of cats have followed and we still have one now. I love Wales. I love hearing the Welsh language and wish I spoke or understood it better. I have never really subscribed to a popular English view that the Welsh speak Welsh to annoy people from England. I rather think they speak it because it is their language – and beautiful and musical it sounds too. But Llanfairpwllgwyngyllgogerychwyrndrobwllllantysiliogogogoch is something of a mouthful. The name was invented in the 19th century in an attempt to get tourists to stop there. It certainly worked. Of course, crucial to the development of tourism was the arrival of the railway and a railway station. Llanfairpwllgwyngyllgogerychwyrndrobwllllantysiliogogogoch was first stop on Anglesey, over the Menai Bridge from the mainland. 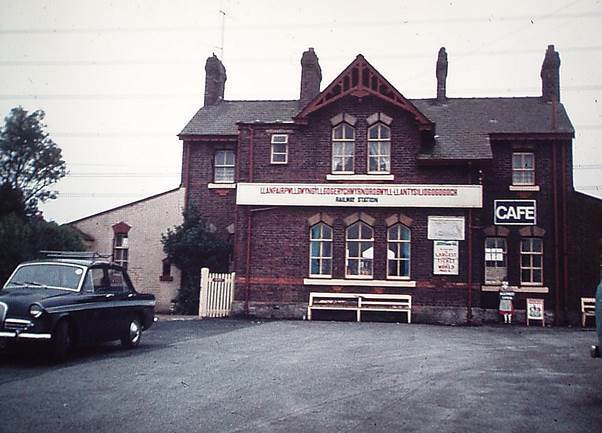 And here is that station in 1972. I think both my wife and I must have photographed this building. I suspect I had the Agfa and took the black and white photo and my wife had the little Canon and took the colour slide. She got more of the period car on the left. 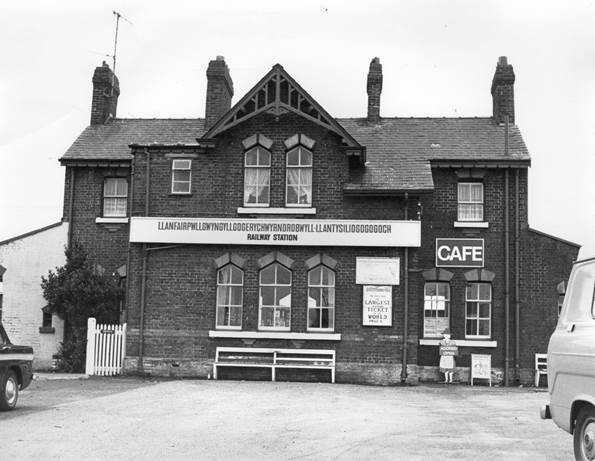 The station opened in 1848 but was closed in 1966. Then, it was reopened after fire destroyed the rail link with the mainland and it still has a train service today.